The ability of Occupy Wall Street protesters to remain in Zuccotti Park in Lower Manhattan for weeks while Occupy groups in other cities are being evicted from their encampments is, ironically, based on the fact that the park is private rather than public property. But it’s a special category of private property. The park was created more than 40 years ago as part of a deal in which U.S. Steel, which was building an adjacent office tower now called One Liberty Plaza, was allowed to put additional floors on the structure in exchange for providing an open space for the public. The space is not subject to the same rules, including curfews, that apply to city parks. 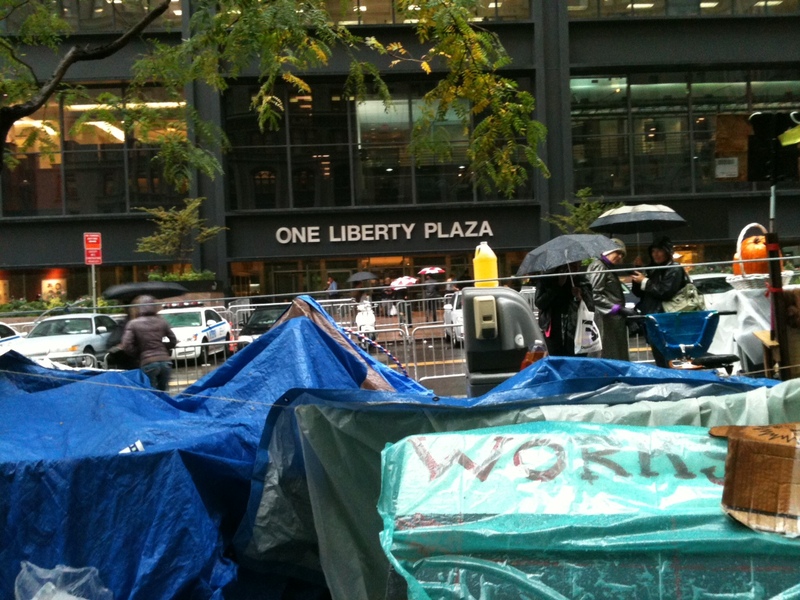 The zoning variance is not the only factor that complicates the status of Zuccotti Park. Brookfield Properties, the current owner of One Liberty Plaza and the park, benefits directly and indirectly from a host of taxpayer-funded subsidies. The New York Daily News reported on some of the direct grants received by Brookfield after 9/11, and further details on the full extent of subsidies are in the chart below and in our Database of Deals. Brookfield, one of America’s largest commercial real estate companies and its premier tenants, took advantage of city and state economic development programs. Millions of dollars in economic development grants earmarked for rebuilding after the attacks of September 11, 2001 went to Brookfield and some of its tenants at One Liberty Plaza (NASDAQ and the Royal Bank of Canada among them). Some tenants also received discretionary tax breaks from the New York City Industrial Development Agency. A breakdown of the $176 million given to Brookfield Properties, its subsidiaries and tenants in Lower Manhattan is here. The subsidy figures don’t tell the whole story. There are other economic development programs that Lower Manhattan firms benefit from, but how much is earmarked for a particular firm isn’t publicly known. Among the many reasons why the Occupy Wall Street protesters should be allowed to remain in Zuccotti Park is that they are occupying taxpayer-subsidized space. Thanks to Elizabeth Bird and Dan Steinberg for their assistance.